The cherry laurel or prunus laurocerasus is one of the most commonly used hedging plants. It is a familiar sight in gardens all across Europe and the UK. 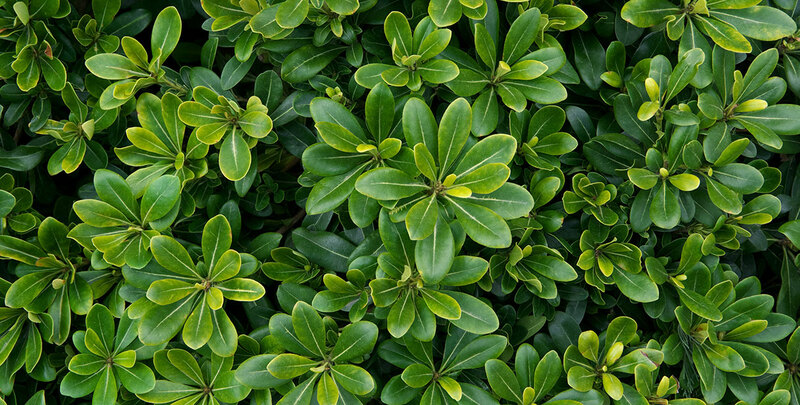 It is a dense, evergreen hedging species that is especially valued because of its large, leathery, bright green leaves, which are simply beautiful. It is also the fastest-growing evergreen hedging plant that is not a conifer, with a growth of approximately 40 to 50 centimetres every year. This extremely versatile, hardy plant can cope with cold winters and will do well anywhere from full sun to deep shade, while also being very tolerant of soil conditions; nearly all well-drained soils are suited for this marvellous hedging plant. Despite being called a “laurel”, prunus laurocerasus is actually a member of the prunus genus, which includes a number of plants that all bear so-called “stone-fruits”. This is also true for the cherry laurel; the white flowers that grow on the cherry laurel during springtime are followed by red, cherry-like berries in the autumn. Both are fairly inconspicuous though. 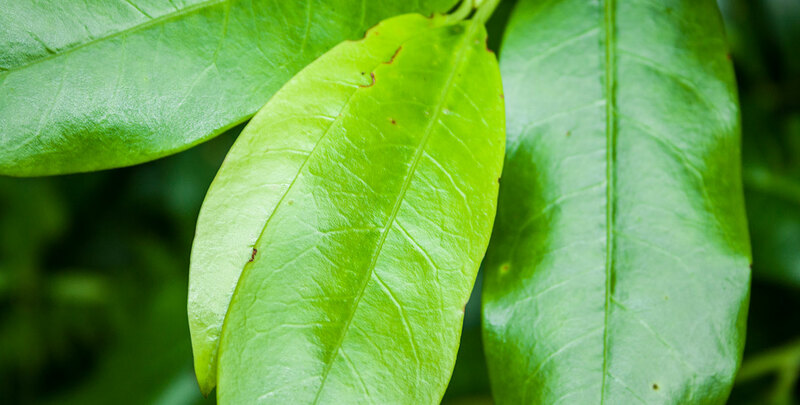 However, the name of this species is based on the strong resemblance its foliage bears to the bay laurel, despite not being related to each other. Another important difference between these two species is that the bay laurel is edible, while the cherry laurel is poisonous. While its berries may look appealing, they should never be eaten. Cherry laurels are native to the countries bordering the Black Sea, the Caucasus and parts of Turkey and Iran. During the Late Middle Ages, it was one of the very first “exotic” hedging plants to be imported into western Europe. It quickly became a highly popular hedging plant, because contrary to most of the native species that were used as hedging plants at the time, the cherry laurel would hold on to its leaves during the colder months. It made people realize that a garden doesn’t need to look bare during the dark winter months. Therefore, the rise of cherry laurel hedges may even be considered a pivotal moment in the history of evergreen hedging plants. Since then, cherry laurels have become widely naturalised to the point that they have even become invasive plants in some regions. Their rapid growth and tolerance of shade and drought have enabled them to thrive at the expense of native plants. Birds have been essential to the spreading of this species, as they – unlike people – can eat the berries of the cherry laurel and then spread their seeds through their droppings. 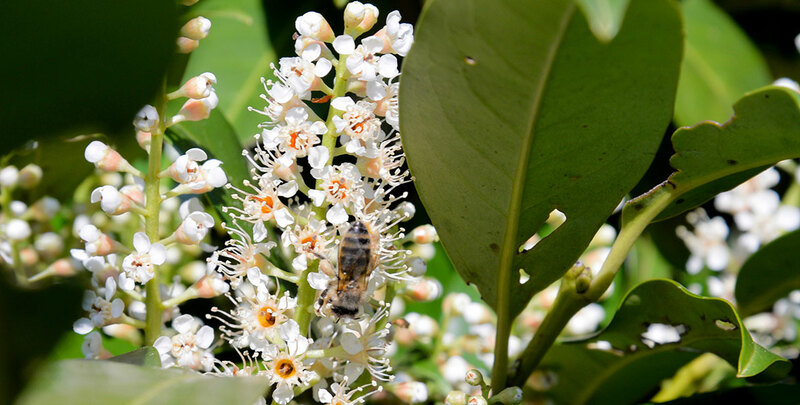 Besides birds, bees and butterflies are also attracted by the cherry laurel, so if you are looking for a hedge that will make your garden livelier, a cherry laurel hedge would be an excellent choice. The image people usually associate with evergreen hedging is a rectangular conifer hedge or a low box hedge. These plants are evergreen hedging classics for a reason: they have proven to be the ideal plants for hedging purposes by providing screening throughout the year and responding very well to being pruned to a more formal shape. When people think about informal hedges, they often think of deciduous hedging plans. But if an informal appearance, as well as flowers and fruits are what you are after, you do not necessarily need to plant a deciduous hedge in your garden; a cherry laurel hedge will give you all that while holding on to its spectacular leaves even when most flowering hedging plants have shed them. The cherry laurel is truly the best of both worlds. The main attraction of a cherry laurel hedge is, of course, its foliage. The leaves are thick and shiny, but the foliage of a cherry laurel is also dense enough to ensure the privacy of its owner. It should be noted, however, that slow-growing varieties generally do not grow to a height that allows them to be used as a proper screening hedge. This mainly applies to the ‘Zabeliana’ and ‘Otto Luyken’ varieties, which generally do not grow faster than 20 centimetres each year. Other cultivars are faster growing, with some of them even growing faster than popular hedging conifers such as the Lawson cypress, the thuja and the yew. In fact, in terms of growth speed, ivy is the only evergreen non-conifer that outdoes the faster-growing cherry laurel varieties. And should you wish to plant a hedge that will attract butterflies and insects to your garden, cherry laurel is one of the few evergreen hedging plants that will fit the bill. Of course, you can always choose to plant a butterfly bush, or any other hedge plant with striking flowers, but if screening is another condition, deciduous plants just will not do. Osmanthus is another evergreen plant with gorgeous, fragrant flowers, but it is relatively slow-growing and will not grow tall enough to keep wandering eyes out of your garden. If you are looking for a hedge that will combine the best qualities of evergreen hedging and flowering hedge plants, cherry laurel is truly the species to go for. There are various varieties of cherry laurel available. By far the most popular and widely used variety is the ‘Rotundifolia’, particularly chosen for its growth rate, handsome large leaves and tall, wide growth habit, which allows for economical planting, as you will need fewer plants per metre. Rotundifolia is not a modest plant: it grows very large very fast and will form a substantial, thick hedge, which can be invasive if not kept under control by pruning at least once or twice a year, preferably during springtime and in the autumn. Fortunately, cherry laurels are very tolerant of (hard) pruning, which also makes them ideally suited for large topiary. However, it will always have a more informal appearance than common yew or box topiary. Rotundifolia’s growth habit makes it unsuited for smaller gardens, where it will take up too much space. Small gardens are better off with more compact varieties, such as ‘Otto Luyken’, or the extremely hardy ‘Zabeliana’, which is ideal for areas that suffer from extreme winters. We have also included the related prunus lusitanica or Portuguese laurel in the same category as cherry laurel as its qualities as a hedging plant do not differ much, although it is not actually a species or variety of the cherry laurel. 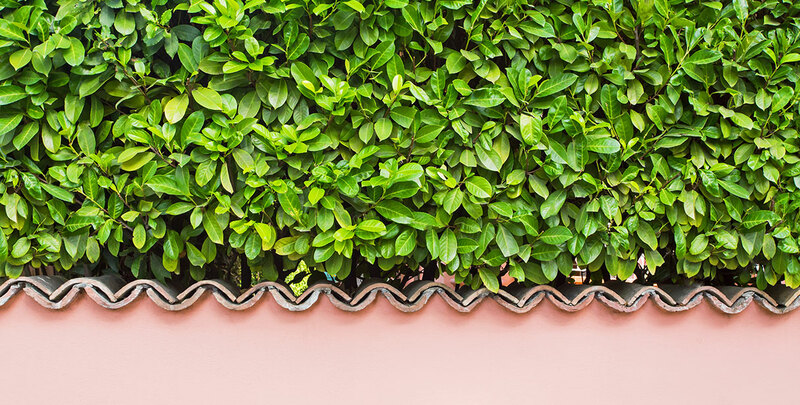 This does not mean that there are no differences at all: Portuguese laurel hedges are more formal, slower growing, less invasive, less poisonous, slightly tougher, more tolerant of exposed sites and more easily trimmed. Cherry laurels should not be exposed to strong winds in coastal areas. If your garden is a tricky location, the aucuba japonica, the Japanese or spotted laurel, would be a better choice. Besides being beautiful and tolerating all soil types except for chalky ones, cherry laurel is also known for being quite hardy. The ‘Zabeliana’ and ‘Etna’ cultivars can even cope with winter temperatures of well under -20 °C. Other varieties require winters that are slightly warmer, but will still perform admirably during the average British winter. Most varieties available are able to cope with 15 to 20 degrees of frost without too much trouble. The elegance of the cherry laurel’s leaves is virtually unparalleled, which is why, so many years after the species was originally introduced to European gardens during the Late Middle Ages, the popularity of cherry laurel hedges is still immense. However, its ornamental value is hardly the only reason why cherry laurel hedges are such a familiar sight among European gardens to this day; the cherry laurel simply has a number of qualities which make it extremely suitable for hedging purposes. Its exceptionally fast growth will guarantee your privacy and its versatility makes the cherry laurel a welcome addition to just about any garden. If your garden is not big enough for the popular Rodundifolia variety, you could always consider some of the more compact varieties, a majority of which have been specifically developed for smaller gardens. Naturally, that does not mean that there is no place for them in more spacious gardens. Copyright © 2017 HedgesOnline.co.uk. All rights reserved.